"Before going to Hill Crest and meeting Dave, We had our lab puppy with another trainer (4 months wasted). He said she didn’t have it in her. We met with Dave, he showed us his training program with couple of the other dogs he had been working with. We left her with Dave that day. Dave called us a week later to tell us that he thought she would make a good hunting dog. Dave always welcomed us to come train with her. Very pleased with her. Thanks Dave"
"I brought my 11-month-old lab Rex to Dave in September. The lab came from a good litter in Texas. I own his uncle now and have hunted over his mother for ducks and geese. Both dogs had great prey drive, listened well, and were great with the family. I brought Rex to another trainer earlier in the year and was told that he was a washout. The trainer said he has tremendous desire but doesn’t respond to pressure. He recommended that I take him home as he was going downhill. Rex was there for 9 weeks and was significantly worse than when I first brought him there. You could tell he was softer than my other dog but he was now also afraid to bring the bumper to hand. I was very frustrated and started investigating other trainers. A friend told me about Dave so we went to him for an evaluation of Rex. Immediately he diagnosed that Rex had been severely pressured by the other trainer and was afraid of getting shocked. He admitted its hard to fix a dog that went through that but he had some experience with another dog that he was able to fix. Fast forward 10 weeks and Rex is a completely different dog. He has been force fetched and comes back with the bird, tail wagging. I witnessed Rex retrieving a bird from 300 yards last week and taking a direct line back to Dave with bird in mouth to a sitting position. Last week Rex received a cripple from 80 yards and again brought it back to hand. Dave told me Rex was a tough one to figure out given his negative response to pressure but once he did there was no holding him back. I'm obviously thrilled with Dave and would recommend him to anybody with a new hunting dog. He showed flexibility and understands positive reinforcement with a dog. I also liked that Dave texted me every couple weeks with a progress report. Rex can now take some pressure and is very comfortable with the e-collar. I can’t wait to hunt over Rex and I owe it all to Dave. He’s a one of a kind trainer." "I brought my year and a half old chocolate lab “Roxy” to Dave at Hillcrest Retrievers in July of 2014. Before I dropped her off I went over to meet with Dave. He thoroughly explained his training sequence and ran my dog through a few assessment drills to see what he was working with. Dave gave me an honest assessment of her abilities and what I could expect for her to accomplish. I decided to leave her with Dave for a month. One of the hardest things to do is board your dog for any amount of time. Dave eased this burden by giving me regular updates on her progress and allowing me to come out whenever I was available to train with him. Dave not only let me handle my dog, but I was able to handle more seasoned dogs which definitely helped me have a better understanding of what to do with Roxy. Dave also invited the lady who walks my dog to come out and train with him as well. When I first dropped Roxy off I told Dave that I just wanted him to get her ready for the hunting season, no hunt tests or field trials. I had my dog with a trainer last summer for a bit and she did have some of the basics but was very rough around the edges. Dave told me that he would do his best to get her ready for the hunting season. I did not return to the kennel for two weeks but when I did I was blown away with what Roxy had accomplished with Dave. Her progress was AMAZING! As I said, Dave sent me updates via text but I really did not understand how well she was doing until I actually saw her work. My intention was to only leave her for one month but after I saw her progress at the end of the month I decided to let Dave train her for an extra month. During the second month, I was able to train with Dave both at the kennel and in the field. I’m an Assistant Principal in a high school who observes good teaching every day and I can attest that Dave’s calm manner and sound techniques make him an excellent teacher, not just for the dogs, but for the handlers as well. Because Roxy has progressed so well, Dave and I decided to get Roxy ready for the Junior hunt test. Dave worked diligently with Roxy to get her ready and it worked! Roxy got her Junior Hunter title. I still take Roxy to Dave either for weekly sessions and it is well worth it. If you are looking for someone to train your dog in either obedience or retrieving, give Dave at Hillcrest retrievers a call. I am so impressed with his operation. I give him my highest recommendation!" 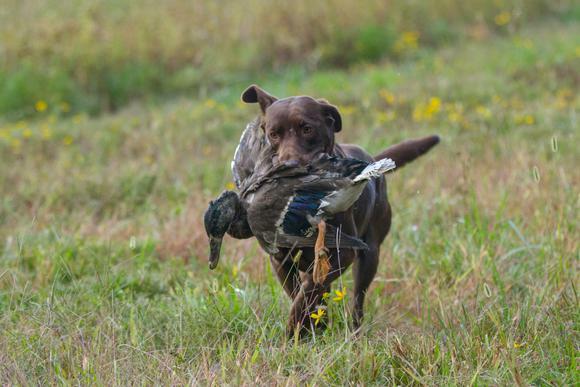 "We recently had our son Dylan's Chocolate lab, "Trek" trained by Dave Wolcott for waterfowl hunting and I must say it was a great experience! Dave did a fantastic job and was flexible with us and our desire to have Trek home on the weekends and was always available to answer questions and kept the line of communication open. Trek is an incredible retriever and it has been a joy to watch him mature into a true waterfowl hunting dog. Thanks Dave!! We would definitely recommend him to others who desire a well trained dog all the way around!" "My journey to learn more about behavior modification and dog training paralleled my appreciation for top level performing gun dogs and retrievers and the work it takes to train them. I have been greatly inspired by several top professional retriever trainers including Dave Wolcott of Hillcrest Retrievers." "I purchased a trained black female Lab from Dave in May 2010. I had Dave ship the dog to California. I was very impressed with Lilly's training. She did everything Dave said she would do. She arrived in excellent health and adjusted to her new home very well. Lilly runs beautiful blinds and is very responsive to every command. Thanks for a wonderful dog." Before we used Dave Wolcott and Hillcrest Retrievers our Bordeaux Mastiff "Chunk" was a mess. We wanted to send our dog to someone we could trust. Our dog loves working with Dave and Hillcrest Retrievers. Dave Wolcott worked hard on her obedience training so that we could control her. Dave not only trained her, he also spent a tremendous amount of time with us so that we handled our dog properly. We would recommend Hillcrest Retrievers to anyone."